Last week I was lucky enough to be picked to be in the audience of BBC Question Time when it came to Gloucester. I even had my question selected which meant that I got to read it out. This was quite an accomplishment as 1000 people had applied to be in the audience, 150 were chosen and all of those 150 submitted at least one question. 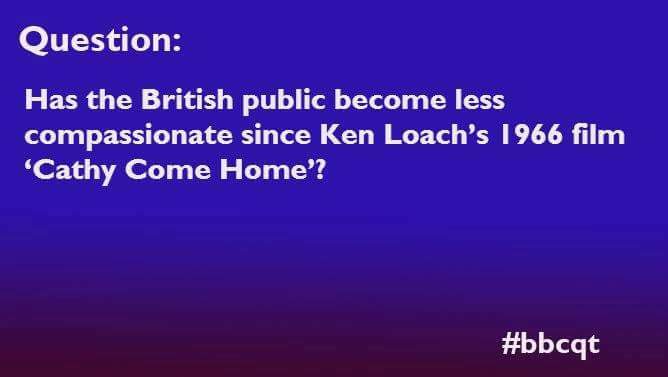 I asked this question because Ken Loach himself was on the panel. He was brilliant; I recommend looking up the episode on iplayer or YouTube just to listen to Ken Loach . It was an amazing experience finding out about the show and being part of it. Here are six interesting facts about the programme that I learned . It is not broadcast live but it is filmed all in one go and broadcast exactly as filmed with no editing. They didn’t even bleep out the four letter word that one audience member used. We finished filming about an hour before it went on the air, giving me enough time to get home, pour myself a glass of wine and go on Facebook to tell all my friends to watch . You get tea, coffee and biscuits when you arrive. David Dimbleby is a lovely gentleman . He spoke to us all in a room before we started filming about what we should and shouldn’t do. (Do boo if you disagree with what someone is saying; don’t say hi to your mum.) He chatted and joked with us in a very natural and genuine way so you would never guess, if you didn’t know, that he must make the same jokes to a different audience every week . They have a practice run with members of the audience sitting in for the panel in order to test the cameras and the sound. This is when someone reads all the questions and selects the ones to be used in the show. You only get to know just beforehand if your question has been picked. They interrupt the practice run to read out the names of the successful people who are then taken outside the room for a quick talk on how to read your question which is handed back to you printed on a piece of paper. Even then you can’t be sure that your question will be used because they have to pick more questions than they need just in case the debate dries up on one particular topic. The panel don’t know what the questions are going to be so they have to think on their feet which some of them do better than others.